This interface emulate memory paging of russian ZX "clones". 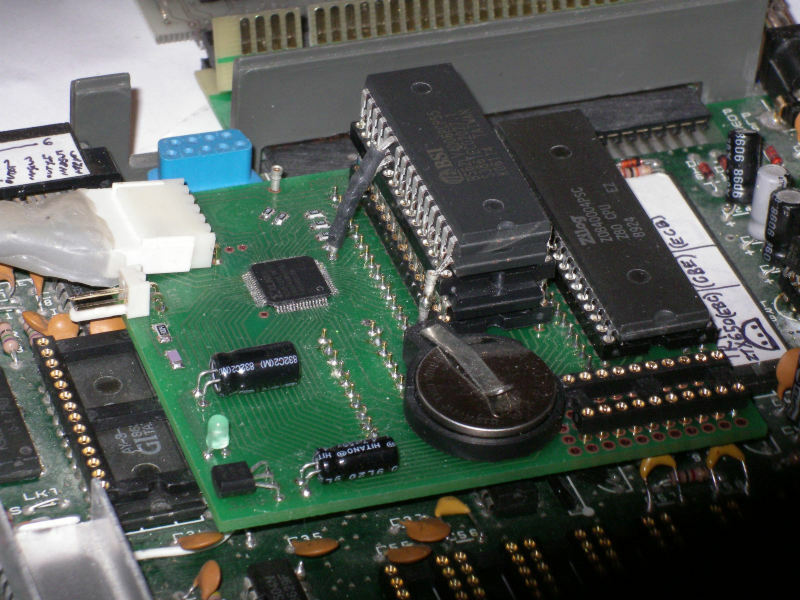 What features and ports must be implemented for possibility run ATM TRDOS on original ZX 128 ? My interface can support memory paging in full adress space 64kB, allram mode, 1MB ram , etc. But full emulation of ATM TURBO 2+ is impossible. system port have base address 0xFF77 but it use tricks in decoding port address - some of address bus bits used as data bits (to simplify decoding circuit). All of this ports are shadowed in trdos space, you need to activate this ports via 0x3d2f entry point by writing A9=0 to system port. PS. I look at vg93emul source code and see that it uses port 0xEF(hdd port) to load data from hdd. To adapt this to others zx clones you need to modify this code (talk to CHRV and ask him for source code of vg93emul). Last edited by deathsoft on 13 Dec 2009, 14:10, edited 1 time in total. deathsoft wrote: PS. I look at vg93emul source code and see that it uses port 0xEF(hdd port) to load data from hdd. To adapt this to others zx clones you need to modify this code (talk to CHRV and ask him for source code of vg93emul). This trdos can work also only with ramdisc = can work without IDE ports. Yes this is the same as on maxagor site (on maxagor site A14,A15, but i change columns to A15, A14 as in binary numbers). when you write to port 0x7F77 - you change page in bank 1 and so on. Last edited by deathsoft on 19 Dec 2009, 23:59, edited 1 time in total. 0x3F77 and 0x7F77 is system port, or no ? Actually I disassembly ATM TRDOS rom and find all OUT commands to system port and memory ports. In this trdos I see only one OUT to system port ( OUT FF77,A3 ) and some other OUTs to port FFF7 only (paging ram in area 16384-32767). I can emulate this port in my PROFI INTERFACE. Last edited by VELESOFT on 20 Dec 2009, 04:07, edited 1 time in total. VELESOFT wrote: 0x3F77 and 0x7F77 is system port, or no ? 0x3F77,0x7F77, 0xBF77,0xFF77 - are memory manager posts for bank0 (0 - 0x3FFF), bank1 (0x4000-0x7FFF), bank2 (0x8000-0xBFFF), bank3 (0xC000-0xFFFF). The data writen to this ports select memory page (one of 64 pages) independently in each bank. You can map any ram or rom page in any memory bank. FF77 - is port for memory bank3 at addresses 0xC000-0xFFFF (data writen t this port select one of 64 pages in memory range 0xC000-0xFFFF). Last edited by deathsoft on 20 Dec 2009, 23:45, edited 1 time in total. xx77 - is system port.